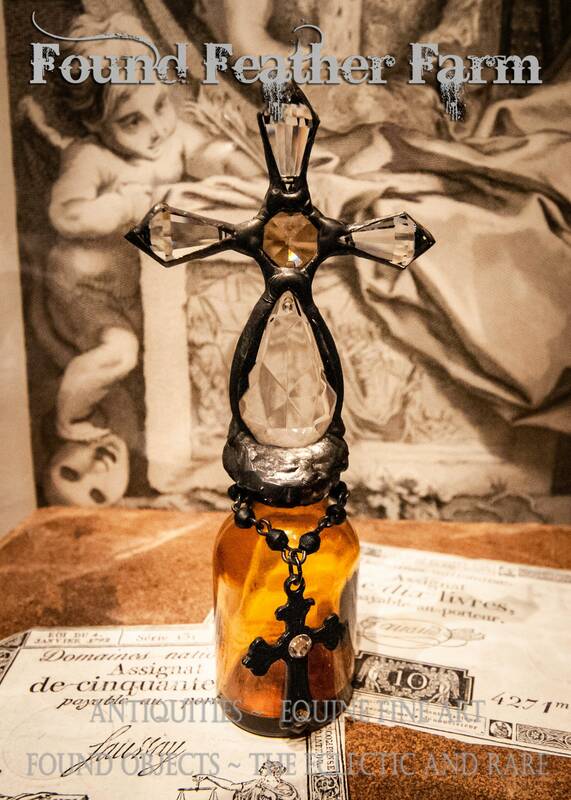 This specific one of a kind Glass Cross Bottle has a rare century old glass bottle base that dates from the early 1900's. This tiny amber glass antique bottle features a sparkling cross made of clear and topaz vintage French chandelier crystals. Size: Height 5.15"x Width 2.25"x Depth 1.35"
This is a handmade, handcrafted one of a kind original work of art. 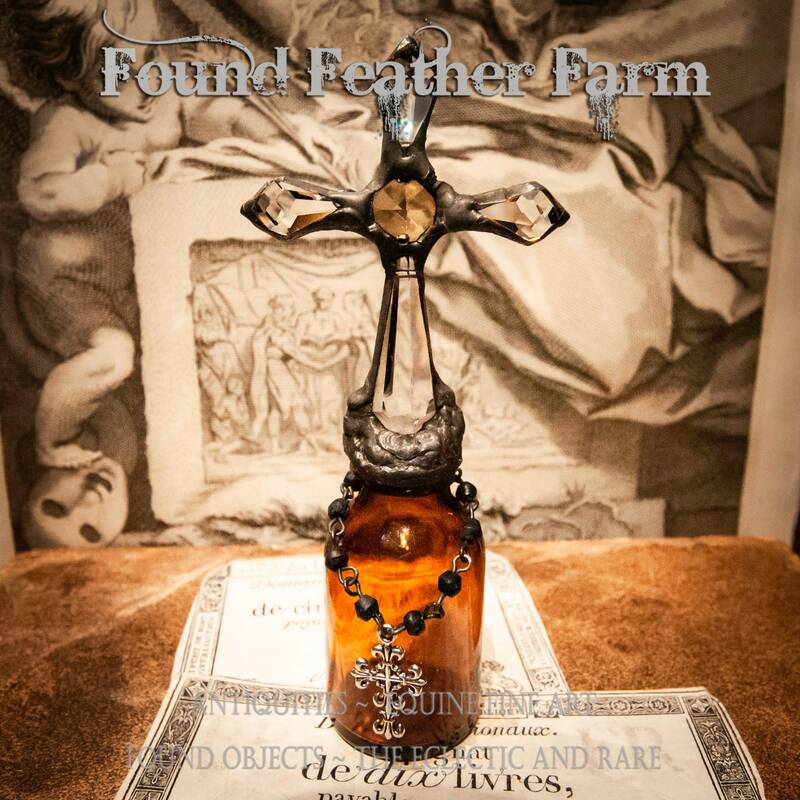 This is a Glass Cross Bottle crafted by an artisan in our studio who carefully selects and articulates each of the stunning antique vintage components and puts them together as an original and very unique work of old world artistry. Our Glass Cross Bottles are made from antique unearthed glass bottles, most over a century old, and each with a rich time worn history and a story all of its own. Each bottle, some from the early Americas and most from Europe, has an archival patina kissed by age and its own unique declaration of another era of time gone by. We add reclaimed and collected parts from European lead crystal chandeliers both vintage and antique and other vintage crosses of metal, brass, bronze or pewter. 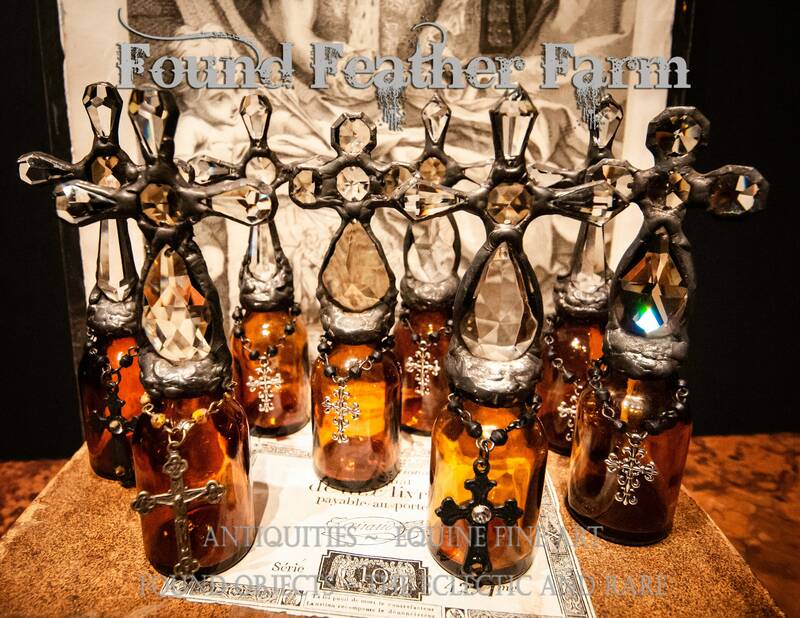 These bottles, for the artist, are a very special interpretation of God's Grace at the Cross of Calvary. They celebrate the creative artistic gifts that are given to us by the Creator to reflect His brilliance and His great gift of love for us all as individuals created in His image. It is our hope that the beauty of these artistic bottles will have a very special meaning to all that chose to own or to share one and that they will bring great joy along with their incredible shimmering beauty.